Size of photo: 33mm x 48mm (3.3 x 4.8 cm). Acceptable head height in the photo: 28mm – 33mm. 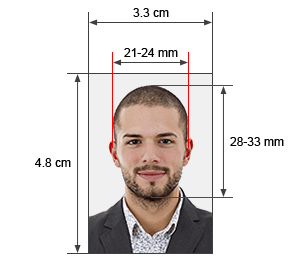 Acceptable head width in the photo: 21mm – 24mm. Color of background: white or light blue.